From legendary Hollywood director Howard Hawks, Mans Favorite Sport? 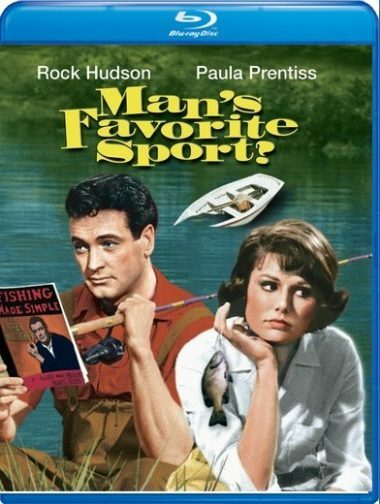 features Rock Hudson and Paula Prentiss in a hilarious fish-out-of-water tale The Film Daily applauded as simply delightful.Roger Willoughby (Hudson) is happily employed as one of the worlds great angling experts. Unfortunately, even his own boss doesnt know that Roger has never been fishing in his life. So when press agent Abigail Page (Prentiss) arranges for Roger to participate in her resorts upcoming fishing tournament, hes thrown into a panic. At the resort, he and Abby commence a crash course to turn him into a genuine outdoorsman — only to have their plan riotously upset by a surprise visit from Rogers fiancee.With a sparkling score by composer Henry Mancini, Mans Favorite Sport? is a comedy classic youll fall for hook, line and sinker! 1963 – COLOR -121 Minutes – Blu-Ray. One of my favorite movies. Starring Rock Hudson; Paul Prentiss; Maria Perschy.